Going around in shopping centers, you will most probably stumble on a person in a red Santa suit, with the long white hair and matching beard. And, of course, you would also find the child or children on his lap and a flash signifying the taking of a photograph. The Santa Claus we know, which we now find in Christmas cards, magazines, posters and so on looks like the shopping center Santa that we are familiar with. Was this always the case? 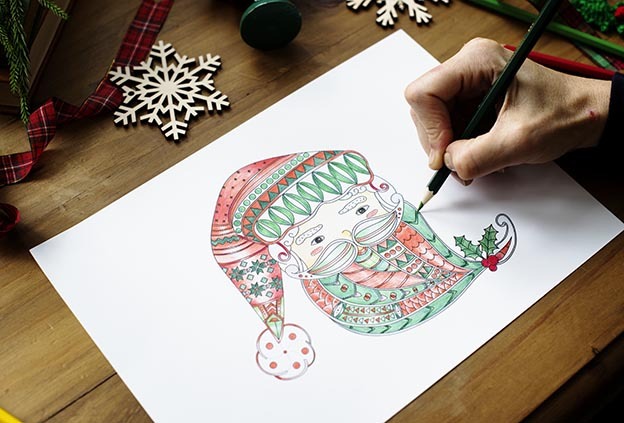 Santa Clause, also known as Father Christmas dates back as far as the 16th century in England when he was pictured as a large man in green or scarlet robes lined with fur. In the Netherlands and Belgium, the character of Santa Claus has been known as Sinterklass, which is quite possibly Santa’s progenitor. Santa Claus is known as de Kerstman in Dutch (“the Christmas man”) and Père Noël (“Father Christmas”) in French, similar to Papá Noel in Spanish. Each of the above representations always seemed to show a bearded man. Though not all wore the familiar red costume. As for the Santas, we see in shopping centers during the Christmas season, that look now familiarly associated with Father Christmas, we really have Coca-Cola to thank. The first appearance of the bearded bloke as we know him today was in the 1920s as part of an illustrated advertisement in US magazines. Previous to the happier Santa, the original caricature was a not so jolly illustration as drawn by Thomas Nast. It wasn’t until the 30s that a more jolly figure appeared. Haddon Sundblom , an illustrator, who got his inspiration for the character from Clement Clark Moore’s 1822 poem which is better known as “’Twas the Night Before Christmas”. Sundblom’s Santa debuted in 1931 in Coke ads in The Saturday Evening Post and appeared regularly in that magazine, as well as in Ladies Home Journal, National Geographic, The New Yorker and so on. After that Christmas marketing communications pieces from Coca-Cola tended to feature the now familiar red-suited and bearded Santa Claus. From 1931 to 1964, Coca-Cola’s advertising showed Santa delivering toys (even playing with them! ), pausing to read a letter and enjoy a Coke, visiting with the children who stayed up to greet him, and even raiding the refrigerators at a number of homes. The original oil paintings Sundblom created were adapted for Coca-Cola advertising in magazines and on store displays, billboards, posters, calendars and so on. Many of those items are popular collectibles today. So, we can see that a commercial exercise like advertising during the Christmas season may have repercussions with society in general. And, just an aside a number of Coca-Cola messages have become part of popular culture. Well, it’s that time of the year, so we take this opportunity of wishing everyone the best of the season. Happy Christmas everyone! Watch this space for some interesting offers for existing and new clients in 2018.